A month or so ago, I was playing around with the Altenew Watercolor set and I created a couple of practice panels in varying different colours. Today, I turned one of those panels into a card. I don’t like to waste anything unless I really don’t like it so this card was pretty simple to put together. For the background panel I used Arches Cold Pressed cardstock and I applied four different colours from the Altenew Watercolor set – Crimson, Warm Sunshine, Bamboo and Forest Glades. I applied them using a wet on wet technique and went diagonally across my panel making sure to overlap the colours and create different blends. For today’s card, all I did was trim the panel down slightly to fit an A2 top folding base card and adhered it with some very strong double sided tape. I then took the SSS Marilyn Full Card Die and ran that through the Big Shot with some Neenah 80lb. I used a craft pick to poke out all the little white pieces and I did use a metal shim to die cut it as it is an intricate die. It needed a few passes through the machine also. Next I applied tiny dots of Multi Medium Matte over the back of the die cut and adhered it down onto the watercoloured panel. 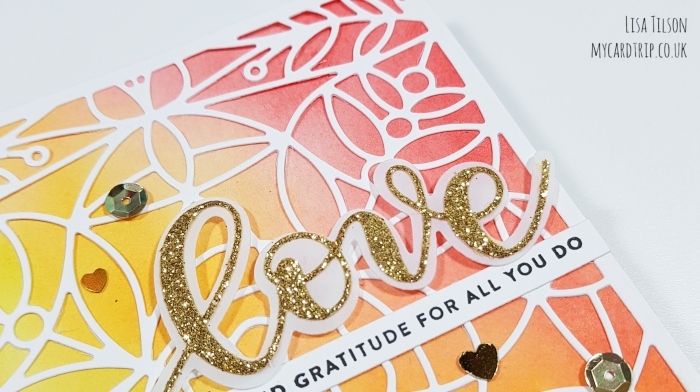 I die cut the “Love” sentiment from gold cardstock and it’s shadow die cut from vellum. I adhered the gold Love to the vellum with tiny dots of adhesive and then behind the vellum, tiny bits of foam tape and popped that onto the panel. The sentiment from SSS Big Thanks was stamped with Versafine onto Neenah 80lb and trimmed with a SSS Sentiment Label die. This was also adhered with MMM. Lastly a few sequins from my stash to give some extra sparkle. It was really difficult to capture the sparkle in this card, but I did pop a little video up on Instagram which shows it much better. Thank you as always for joining me today, I hope you have a wonderful week and manage to fit in some crafting time. i love that Marilyn die – it’s one of my favorites. i have colored it, inlaid it, used it over and under things. i made a stencil out of it and keep it on hand as well. it’s just soooo pretty. such a pretty, simple card. Fab idea to keep panels, you never know when inspiration will strike and then it’s so handy to have ready made backgrounds on hand.